SSU custom linemen gloves are design to give you the add protection you need when playing on the line. Custom made with your team logo and colors, you’re ready to take on the toughest oponent and know you’re well protected. Our football gloves have velcro closure wrists. 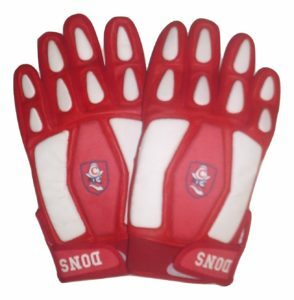 Linemen gloves have palm and back of the hand padding for added protection. Customized with your team logo and colors, your game ready when you take the field in the Maxxim Sports custom linemen’s football gloves.